Blagger n. a smooth talker; a persuasive person. 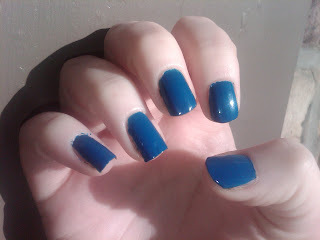 Since I equate the month of January with the color blue (no, I'm not a savant), I wanted to go with something vibrant. 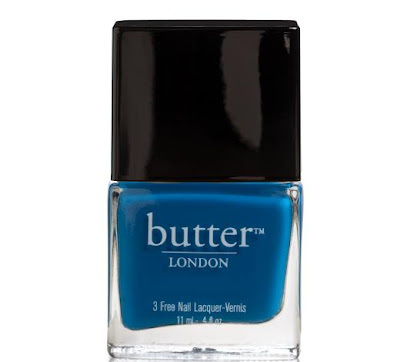 I purchased my first stash of Butter London polishes with a gift card I received for Christmas. Blagger was one of the polishes I selected. It's reminiscent of OPI Dating a Royal. So far, I'm impressed with the Butter London formula. Blagger only required one coat to achieve opacity but I did two coats for safe measure. I really love this particular shade of blue and definitely recommend checking it out. Side Note: I previously had my nails painted with Sinful Colors Stormy but neglected to post about it.﻿ It's a gorgeous darkened teal shade with sapphire blue microshimmer. In certain lighting it appears teal green/blue but in others, nearly black. The formula and application is a bit tricky to work with but I suggest checking it out if you're looking for an affordable polish in this shade ($2 at most drug stores). *One of the few country songs that I really love! "Settle For a Slowdown" is also a favorite!